Agoraphobia is a type of anxiety disorder in which you fear and often avoid places or situations that might cause you to panic and make you feel trapped, helpless or embarrassed. With agoraphobia, you fear an actual or anticipated situation, such as using public transportation, being in open or enclosed spaces, standing in line or being in a crowd. The anxiety is caused by fear that there's no easy way to escape or seek help if intense anxiety develops. 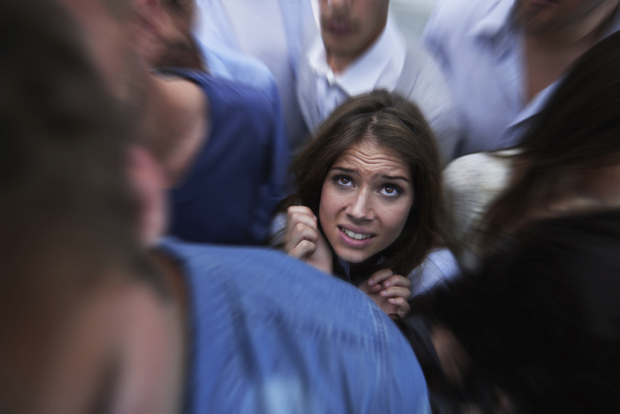 Most people who have agoraphobia develop it after having one or more panic attacks, causing them to fear another attack and avoid the place where it occurred. Agoraphobia treatment usually includes both psychotherapy and medication. It may take some time, but treatment can help you get better. Also known as talk therapy or psychological counseling, psychotherapy involves working with a therapist to reduce your anxiety symptoms. Cognitive behavioral therapy is one of the most effective forms of psychotherapy for anxiety disorders, including agoraphobia. Generally a short-term treatment, cognitive behavioral therapy focuses on teaching you specific skills to gradually return to the activities you've avoided because of anxiety. Through this process, your symptoms improve as you build upon your initial success. If you have trouble leaving your home, you may wonder how you could possibly go to a therapist's office. Therapists who treat agoraphobia will be well aware of this problem. They may offer to see you first in your home, or they may meet you in what you consider a safe place (safe zones). They may also offer some sessions over the phone, through email, or using computer programs or other media. Look for a therapist who can help you find alternatives to in-office appointments, at least in the early part of your treatment. You may also want to take a trusted relative or friend to your appointment who can offer comfort and help, if needed. "Give a man a fish, he'll eat for a day; teach him how to fish, and he'll eat for a lifetime,"
I will use clinical hypnosis as an adjunct to psychotherapy session (Psychological hypnosis method): Hypnosis method is used to help patients to reduce cognitive and physical symptoms of anxiety (Frankel and Macfie, 2010; Elkins and Perfect, 2008), and provides you with more control in every day situations (Baker and Nash, 2008). I will also teach you self-hypnosis techniques so you can continue your treatment at home. So next time you feel anxious or overwhelmed, you can practice a brief self hypnosis method and trigger a sensation of calm.